Superyacht owner lets college kids hack $80 million ship. 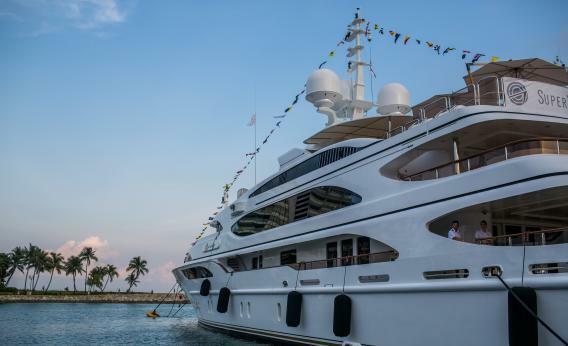 A superyacht (which, presumably, has not been hacked) at the Singapore Yacht Show on April 20, 2013. It must be pretty cool to be one of Todd Humphreys’ engineering students at the University of Texas at Austin. Last year, the U.S. Department of Homeland Security dared them to hack into a drone. (Which they did.) And this year, Humphreys and his students went to the Mediterranean to see if they could hijack an $80 million yacht. Once onboard, Humphreys and his team set up a battle station on the yacht’s upper deck. From there, they took stock of the ship’s current position and velocity, then started beaming GPS signals at the ship’s antennae. This technique is known as “spoofing,” and it works by gently replacing authentic GPS signals from satellites with counterfeit signals of the attacker’s choosing. If civil GPS signals are Monopoly money, then back on the ship Humphreys’ students were making it rain. Without drawing an alarm or disrupting the ship’s instruments, the team carefully took control of the ship’s navigation and set course for a new path. Subtlety is the key, says Humphreys. If you come on too strong, the GPS system will report that it’s lost the signal, potentially tipping off the crew that something is amiss. Given their success aboard the superyacht, Humphreys thinks they could execute the same attack from 20 to 30 miles away—perhaps aboard a small aircraft. Furthermore, if a college is capable of pulling off this sort of thing, the threat exists that someone else might try to do the same. Military GPS is pretty well encrypted, so we don’t need to worry about fighter jets falling out of the sky, but commercial airliners, cruise ships, and all sorts of civilian vehicles use the more vulnerable form of GPS. It’s true, GPS isn’t the only navigational tool in the mix—and a good pilot or captain should be constantly second-guessing her equipment anyway. But the better we make technology, the easier it is to be lulled into thinking it’s infallible. That is, until a terrorist with a laptop steers a Disney cruise ship into a coral reef.